What is the best gaming router? If you’re looking into buying your next WiFi router for gaming, then you have come to the right place. This guide reveals the best gaming routers. There are few things more frustrating than dealing with a problematic router, especially when you’re pressed for time. And when you need internet access for work tasks or media streams or interactive gaming, you will want access that is fast and highly available. That’s why you should invest in a reliable router to manage your local network, and why we recommend budgeting for more than just basic models. The best of the current generation has progressed well beyond the old days of creaky wireless-G networking. If you want the best wireless router for everything and not just specifically for gaming, be sure to read our dedicated guide on that. With their huge feature sets and slick styling, the latest router models incorporate NAS servers, monitor for malware and privacy issues, multiple data streams, and other functions which were previously the domain of separate hardware or enterprise gear. We’ve collected a good sample of many of the better and more fully-featured routers available and reviewed their performance to find out which are worth buying. Looking for the best gaming router today? The table below shows you exactly which routers are the best for gaming in 2019 and it is updated every month. Without any further ado, here is a list of the best gaming routers. We hope you are able to pick the best gaming router for you based on the table below. Moving on from the table above, which shows the best wireless routers for gaming, we will not describe each router so that you get an idea of what you’re buying before you buy it. If you are simply looking to get the best router for online gaming out there, including PS4 gaming and XBOX One gaming, then this particular router is the one to go for. The firmware is gamer-friendly and it’s simply the best gaming router out there today. A lot of marketing hypes up gamer-related aspects, but the new ASUS RT-AC88U from Asus is one of a few which was really designed from the beginning with gamers’ needs in mind. 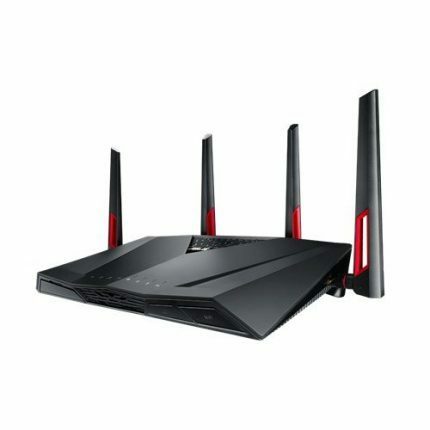 The black and red-accented shell contains a sizeable 8 -port LAN switch which will benefit users seeking to host low-lag co-op gaming sessions or data servers on their local network. Its specifications include USB 2.0/3.0 ports supplying up to 110 MBps of bandwidth, a fast dual-core CPU, and a 4Tx4R antenna cluster providing for two high-speed wireless streams. The company has integrated gaming-oriented QoS and WTFast WAN clients right into the router OS, with no need for you to install helper apps on the desktop. Antimalware services from TrendMicro are similarly integrated into the firmware, which when activated can independently survey and protect the local network and its clients. However, you should think of the router’s malware surveillance features as just another supplementary line of defense, and keep malware scanners active on your devices just to be sure. The capacity for another wireless band has been traded for an advanced LAN feature set, and the AC88U’s balanced design elevates it above the other models tested. This has been further enhanced with link-aggregation functions for much faster line speeds, a practical benefit given the additional Ethernet ports on this model. With two pairs of ports dedicated to aggregating high-speed client links, the other four will still remain available in addition to the suite of wireless connections. 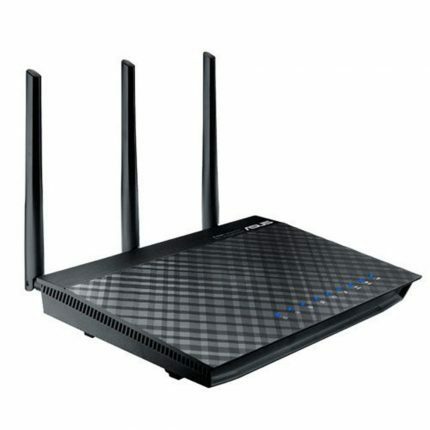 And speaking of Wi-Fi connectivity, this router scores highly in MU-MIMO range and speed as its sustained and top transfer rates marginally exceed that of the other models, although that’s only in the absence of signals congestion in the wireless channels you limit your connections to. But the optimization in favor of wired LAN features is where this router can seem disadvantaged, for it is dual-band model selling in the $300 price range alongside many good tri-band routers which would seem more feature-rich in comparison, particularly if the tri-band functionality is important to your networking scheme. Still, if you use mainly wired LAN connections like the average gamer you should find this model to be very acceptable. You could always patiently pace yourself and wait for further price drops before springing for this fine dual-band router. If you do not wish to stretch the budget too much for “just” a router, then we highly recommend that you take a look at the Archer C7 AC1750 gaming router, which is the best budget router for gaming 2019. It costs under $100 and will give you very good value for money with this good WiFi router for gaming. Bandwidth is 450Mbps at 2.4GHz and 1300Mbps at 5GHz. Yes, it’s a dual-band gigabit router and you can get it very cheap for under 100 dollars. It’s the best-selling computer router in Amazon and with good reason. 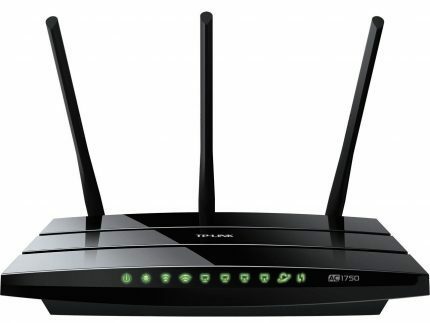 Yes, the best budget gaming router is the best-selling TP-LINK Archer C7 AC1750. Players who don’t have heavy-duty networking requirements may well find the inexpensive unit packaged with their carrier’s data contract to already be a good budget option. But a gaming enthusiast is going to be looking for more than a small LAN switch, basic NAT and firewall functions, and older Wireless-N connectivity in their main router. TP-Link answers the call for more advanced and fully-featured networking with the Archer C7 AC1750 router. The new model follows the trend of multiple antenna clusters being integrated into high-end router models along with many advanced services while getting the basic things right. Although this model may not be the best choice for managing many high-throughput conditions, it would be excellent for light-duty network conditions and brings many useable function and services to small LANs. 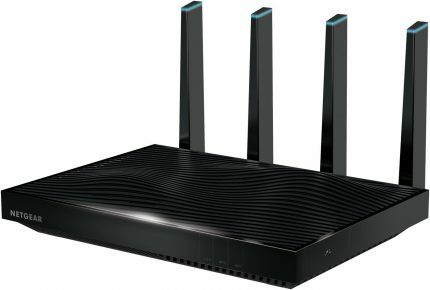 Along with a conventional set of four Gigabit-LAN ports, this model provides for dual-band 802.11ac connections via three pairs of internal/external antennas, QoS bandwidth management, dual USB ports, and a surfeit of networking features that most gamers on a budget will find rather remarkable. QoS features are based on simpler IP access profiles which are not particularly granular in management, although it’s always good to have these management options at such a reasonable price. And you won’t find the USB 3.0 ports, advanced usage controls, and VPN services, or the top wireless range and performance offered by many of its competitors, but they won’t offer this model’s low prices either. For all these reasons it is our pick for the best inexpensive wireless router. We also located the best mid-range budget gaming router, the ASUS RT-AC66U. It delivers excellent performance and is currently the best budget gaming router (top gaming router 2019 under $150). A good upgrade choice in this range would be the ASUS RT-AC66U which price has now dropped to below $150 these days. This classic router is a justifiable step up from TP-Link’s C7 given its better range, stability, and actual Wi-Fi bandwidth. Although the AC66U’s spec sheet are mostly similar to the C7’s, Asus’s model is more than capable of handling several demanding clients at a time and bearing up under heavy network loads they would generate. This is due in no small part to its adaptable router OS and better-quality firmware, i.e. its better QoS implementation in the latest firmware. Still, there are a few disadvantages to considering the AC66U for gaming duties despite its well-earned reputation. For one thing, it features an older single-core CPU, so you won’t be enjoying extremely fast USB data transfers or advanced multiple-channel wireless operation outside of that already established in the base 802.11ac standards, which all these models meet anyway. For MU-MIMO compliance or beamforming enhancements, you will have to look into the next higher rung of models and spend the difference in order to enjoy a higher level of performance and service. This well-known model is already being relegated to ASUS’s legacy ranges, and most enthusiast sites have moved on to recommending newer routers with more advanced capabilities. It’s a mark of the RT-AC66U’s staying power that it continues to sell well. It is still in great demand by those who put a premium on known reliability and performance at a reasonable cost and remains our choice for best budget gaming router. 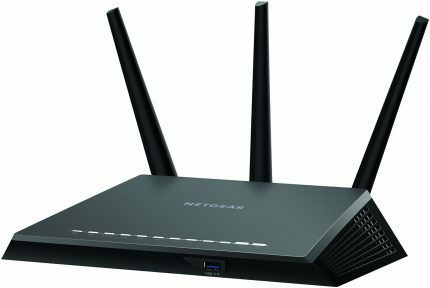 If you’re willing to spend 200 USD on a new router, the Netgear R7000 router is the one to go for. This was a close call between this router and two other gaming routers, but we believe this router will get you the farthest. It’s a great router for home use and gaming. It has a high stability and will give you a low ping and latency. It’s also one of the best, if not the best wireless router for Netflix streaming and you won’t feel any interruptions. Be sure to update the firmware to get the stability in order. Once you’re spending over $200 for a mid-range router model, you’ll likely find yourself deciding on which advanced features and conveniences you’ll have to do without in order to prioritize the ones you truly need or desire. There’s a host of wildly competitive router types battling for technical and market dominance in this product segment, although for no-compromise features and performance you will have step up to a higher level of cost and hardware. Do remember that the increasing degree of applications found in this focus group means that there will be more category winners here, particularly a few which specialize in and excel at certain feature sets, along with an honorable mention or two. The R7000 by Netgear is one of our top mid-range candidates which sport dual-band wireless operation, even though its hardware borders on budget-level specs and features. But its actual street availability ranging in prices at just under $200 place it squarely in the middle of the pack. 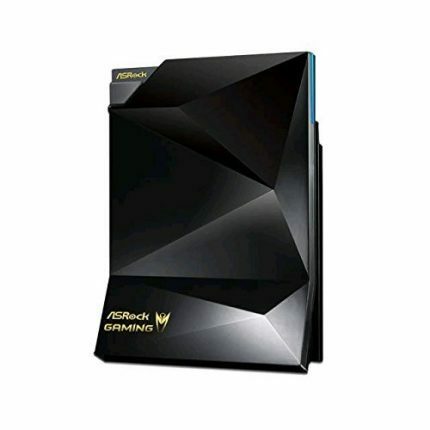 This lower-end version of the Nighthawk has a dual-core CPU, fast USB 3.0 connections for attached storage, and offers among the longest wireless ranges as well as the most stable operation in its group. The open-source community has long been supporting the development of an alternative firmware for the R7000 such as the venerable DD-WRT. This should give you greater flexibility in networking schemes where you may need or desire more functions than the official router OS can provide. But even though this router sports newer hardware than the RT-AC66U, it remains among the older dual-band designs in the market. This may be less of an issue for you if you can find a unit on sale, during the frequent promotions which can see this model’s pricing go lower than $200. But if you are thinking of spending more to get more performance and functions, you’ll probably find better value in mid-range models which offer deeper routing features and greater bandwidth across less constrained wireless channels. It may be that dual-band connectivity isn’t good enough to meet your needs and excite your days, and you’re searching for equipment that pushes Wi-Fi connectivity to the next level. 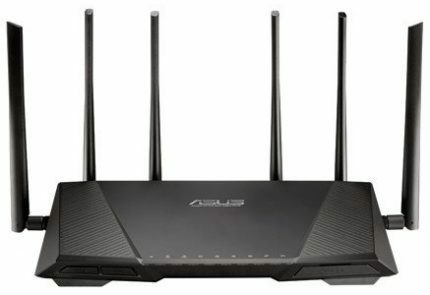 The ASUS RT-AC3200 is a wireless-focused model with almost the same level specifications and performance as the Netgear, but in most cases can cost a bit less at online and street retailers. It suffers in comparison by having only the standard four ports and in its lack of most advanced routing and QoS options for gamers. But it’s big plus is that the model has been out in circulation long enough to evolve a stable firmware state, while newer ASUS routers such as the RT-AC3100 have had only a few months to overcome their teething problems. In markets as mature as networking gear, there will always a bevy of good products which just didn’t quite make it to the gold. Some may yet be golden to buyers looking for their specific advantages, so we list a number of these honorable rivals to help you decide better on all their merits. As an example, those searching for specialty models might want to have a look at the DIR-890L by D-Link, an attention-grabbing model in a futuristic metal case which comes with a decent combination of features such as a tri-band AC3200 operation. Its wireless range and throughput may not be at the very top but are good enough to be considered seriously given its sub-$300 pricing, and its sharp metallic-red finish doesn’t hurt either. If you think ASRock makes intriguing routers, it could be due to the impact their stylishly black ASRock G10 model has had on some reviewers. Basic networking gear is a new area they’ve been trying to enter and succeed in, and this is their remarkable first entry into this market. A magnetic HDMI stick that can serve as a Wi-Fi hotspot during travel and as a streaming receiver is an innovative inclusion in the package, which also contains a pioneering built-in IR receiver that can emulate several remote controls using a Wi-Fi-connected app. That said, this model’s delivered hardware and firmware doesn’t seem to be as forward-leaning as certain of the other routers tested in this review. But the ASRock company has the means and technology to challenge the dominant market players if they’re ready to push their newest products into the mass-market channels and establish their name as a valuable networking brand. The following gaming routers are considered high-end and they can easily cost over $300. They will deliver the highest performance and the longest signal range in their class. The Netgear Nighthawk X8 is one of the best gaming routers for XBOX One and PS4. It has an incredible range and speed and not to mention a 6-port LAN feature. It’s the best tri-band WiFI router out there today! Easily the best router for PC gaming. Of the two models which reached for the top, the new Nighthawk X8 from Netgear gets our pick as the best high-end router for gamers, while the new RT-AC5300 from Asus performed well enough to earn mention as a remarkable alternative. We judged the top wireless coverage and polished firmware of Netgear to be more relevant to gamers’ needs than the faster transfer throughput and sophisticated management options of ASUS, but it doesn’t mean the latter didn’t have some winning aspects of its own. This model’s 6-port LAN cluster includes a pair of aggregated ports, a feature similar to that of the most advanced options found on other advanced models. The hardware is the latest tri-band design comprising a 4-stream radio-array with operating features such as active-antenna beamforming and MU-MIMO signaling. The X8’s surpassing MU-MIMO coverage at our wireless testing grounds was a result of its remarkably strong output and signal-shaping abilities. Although its measured wireless throughput trailed that of a few other routers, the sustained connections were achieved over longer average distances. Thus it was not uncommon to sustain a usable connection outside and away down the road from our offices, a performance which other models failed to emulate with reliable success. Its USB connections also performed well, with attached drives attaining transfer speeds of well over 100 MBps over the USB 3.0 port and straining its gigabit connecting fabric to its limits. The router’s general design and build were exceptional, and its bluish external antenna clusters swiveled readily while keeping their set positions, something which its rivals would do well to copy. Its industrial styling and somewhat futuristic theme may not impress every owner and guest, but it’s still smart-looking enough to fit most any room. The latest firmware won’t win too many design awards either, but it does provide a plethora of usable options which can help you avoid having to continually search the settings to discover functions and tweak for levels of performance which have been obscured in the UI. The company is centered on delivering easy-to-use features, so there are only a few vague settings which may get you searching for instructions. Let us know in the comments below if you found the best gaming router for your budget and needs.